Ladies and gentlemen, Nicole Seah!!! This 24 year old lady has balls! Tells everyone not to be afraid of PAP, asks PM Lee who's paying his salary, whose money is he using for upgrading, etc. And of course, the audience (not only the ahpeks ok) loves her! I'm a fan. Too bad she's not in Aljunied GRC. PAP? NSP? WP? SDP? Which maid agency to choose? It's Nomination Day in S'pore and I'm on Channel News Asia! "I need your urgent advice about employing a maid. As a busy mother, I need someone reliable to help out at home. 1) She flooded my kitchen – she told me that the drain pipe has blocked (she was supposed to clear it once a month but didn’t). Then she assured me that it is very rare and won’t happen again in the near future. Guess what? It flooded again within a year! Even though my maid has worked for me for many years and I value what she has done in the past, I think she is now getting complacent. Her attitude is imperious and dismissive. She ignores my comments and basically treats my feedback as "noise". I wrote to the agency about her behavior; they assured me that they are the best agency around and all their maids are “Commited to Serve” – but I think it is just rhetoric and I don’t see that in her actions. Her salary is much higher than maids in other countries, but the agency say this is to keep her honest and stop her moving to another employer. They say there is a limited supply of maids, and Singapore isn’t big enough for more than one good maid agency, so I should not trust their competitors. Now there happen to be a few other maid agencies - Workhard Pte (WP), New Solutions Pte (NSP), Super Personnel Pte (SPP) and Star Domestica Pte (SDP) - that offered me some helpers who seem sincere, genuine and intelligent. They are keen to work, willing to assist me and have a good attitude. I know that they may take a bit of time to learn how everything works, but frankly I am inclined to give them a chance. People say that the devil you know is better than one you don’t. But I feel that I can’t tahan my current maid anymore. Do you think I should sack my current maid and try out a new one? Appreciate your advice. Footnote: I live in Tanjong Pagar GRC and it seems like I have no choice about my maid agency afterall - I will have to stick with my current maid. For those of you who are fortunate enough to have a choice, celebrate your blessed privilege and exercise your choice wisely. My best wishes to you." My tweet: "PAP not returned to government. Let the battle begin!" was on national TV just a few minutes ago thanks to Channel News Asia! The tweet was in response to news that majority of the seats at this year's General Election will be contested by opposition parties. Yes, it is Nomination Day today in Singapore. Biggest news has to be Worker's Party sending their Dream Team to Aljunied GRC to battle it out with PAP. I can't wait for the battle royale. Welcome to my GRC, Worker's Party Dream Team! And to my fellow residents at Aljunied GRC, vote wisely! PAP? NSP? WP? Which maid agency to choose? 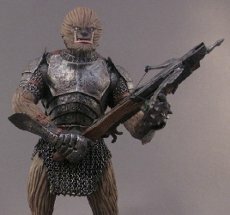 Master custom figure maker Siloff creates a line of medieval Star Wars figures. He writes: "Long Ago & Far Away is a line of custom figures that continues my experiment of breaking down the many influences of Star Wars and emphasizing them individually." 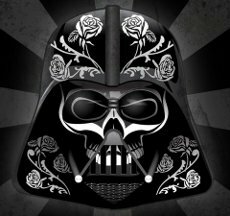 He has given the Star Wars characters a cowboy and western film remake too! 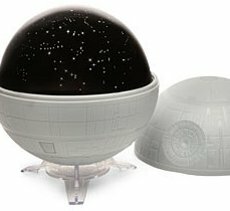 Death Star Planetarium is a tabletop planetarium that looks like the infamous Death Star from the Star Wars movies. It projects the Star Wars galaxy and planet names or if you prefer, the Earth's night sky and comes with a fun and informative learning guide. Pretty useful when you're in your spaceship and you're lost somewhere in the Star Wars galaxy. Nina Suriatmojo bakes cakes for a living in Indonesia. 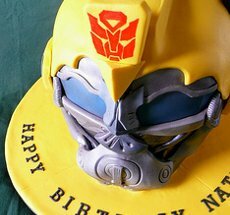 Her latest cake creation is this kickass Bumblebee Helmet cake that she made for birthday boy Nathan. Lucky fella. That's some birthday cake! But how do you eat something like this? I'll keep it in the fridge forever! Check out Nina's other cakes on Flickr or head over to her blog. 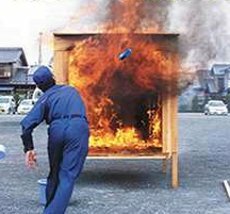 The Japanese have invented a new form of fire extinguisher that is highly portable and very easy to use. Throw the Sat 119 into a fire and like magic, the fire disappears once the canister breaks and releases the fire fighting ingredients. Video of the Sat 119 in action here. Photographer Jamie Beck and motion graphics artist Kevin Burg have elevated the animated GIF to a level approaching fine art. They call their animated GIF art, Cinemagraphs which involve several hours of manual editing before each image comes to life. 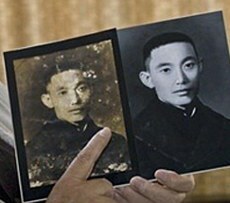 Baojun Yuan learned how to use Photoshop when he was 60 years old and for the past 9 years, he has been repairing old photos for residents for free! So far he has repaired some 2000 old photos. Residents give him their old photos, he scans them, and then does his magic on Photohop. 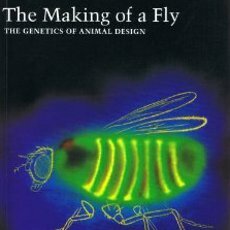 Michael Eisen, an evolutionary biologist spots The Making of a Fly, a book about genetics of animal design, on Amazon selling for US$23,698,655.93! He has an explanation: "I learned that Amazon retailers are increasingly using algorithmic pricing with a number of companies offering pricing algorithms/services to retailers." I think they have taken down the listings but I did find one that costs US$976.98. 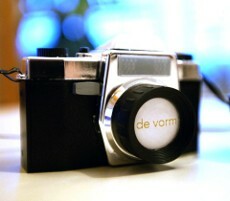 Notcot picks up a Plastiskop camera which doubles as a press kit by furniture maker De Vorm and takes it apart: "I totally wore this silly little toy camera alongside my real one… and inside it? Viewmaster catalog/press kit of sorts! 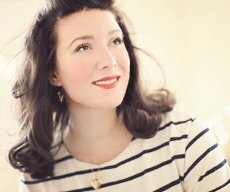 Delightfully fun idea… so simple, so fun, definitely put a smile on my face." I came across Cole Blaq, an avid Lego builder on Flickr. His Lego Metal Storm mecha is his longest Lego project ever and the largest mecha that he has ever built using Lego. 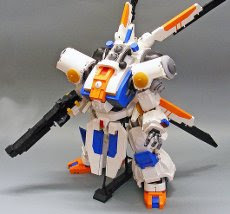 It fits a minifig mecha pilot. Metal Storm is an old video game for the Nintendo Entertainment System. This is pretty neat! The Shirt 2 Pillow Transformer transforms any t-shirt into a pillow. 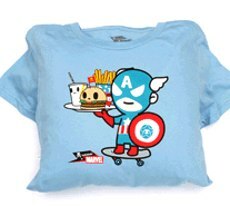 Just put a cushion inside the t-shirt, fold arms and bottom back, wrap the Shirt 2 Pillow Transformer which acts as a cover onto the cushion and your cool t-shirt design is enshrined forever on a pillow. 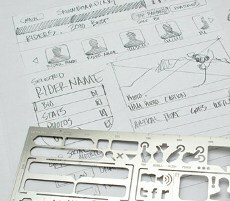 These stencil kits by UI Stencils are designed to quickly sketch user interface, user flows, and ideas for how your app might work. Use the the kit to quickly mock-up application ideas for the Apple iPad, iPhone or the Android. Mr Miyagi in his blog post suggested that Nicole Seah from NSP and Tin Pei Ling from PAP should fight each other. I thought that's a brilliant idea so I decided to put these two young ladies in a Celebrity Deathmatch like you see on MTV. That's Pei Ling on top of Nicole. I know they shouldn't be smiling when they are fighting but girls being girls, they said they want to smile for the camera. BTW, Nicole is 24 years old - 3 years younger than Pei Ling. See! PAP is not the only party that has sweet young things for the General Election. Polling Day takes place on May 7. Let the battle begin. Update: It's confirmed! Nicole Seah and Tin Pei Ling will do battle in Marine Parade GRC on Polling Day! Update: Video of Nicole Seah in her first ever election rally: "PM Lee, who is paying your salary?!" Update: Video of Nicole Seah speaking to voters in Tampines: "Tampines is my homeground! I've stayed here for the past 12 years." Update: He loves me. He loves me not! Does Tin Pei Ling really know? Or does she not? Watch music video here. Tin Pei Ling announces on Facebook she's going to stand on top of moving MRT train! 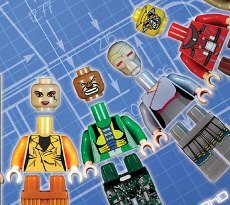 ComicsAlliance has a 19-page preview of BrickJournal's Minifigure Customization, a handy guide to create your own minifigs with step-by-step guides on sculpting and creating decals. Digital format of the book costs US$$3.95. I've always wondered how they make customised Lego minifigs. Now I know. 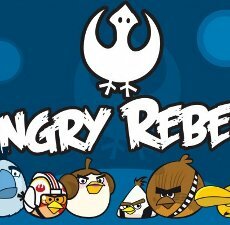 Angry Birds Star Wars Mash-Up is so cool, they should make a game! Steven writes about his Angry Birds Star Wars mash-up (part 1 and part 2): "A long time ago, on an app far, far away… The Imperial Pigs have stolen the Rebellion’s eggs, so the Rebellion struck back by stealing the plans for the Death Pig (many Bothans died in the process)." His glorious images are available on T-shirts too! I'm waiting for the official game. Please make one! Two legends of 80s gameplay, Jenga and Donkey Kong are now one thanks to Donkey Kong Jenga! In this rendition of the game, the Jenga towers are called girders which have small holes in them for inserting the Mario game pieces. 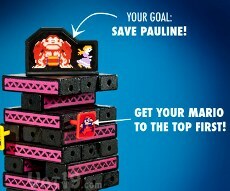 The first player to reach the top of the tower without knocking it over will save Pauline and win the game. 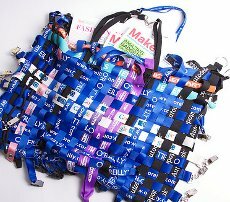 Here's a good use for all those lanyards that you collect from conferences that you attend. You can use them to make a bag! Evil Mad Scientist shows you how: "Breakaway lanyards can be used for the vertical webbing, woven in and out of the continuous lanyards until they reach the top again." Kevin's project Camper Kart, investigates habitats and housing; recycling and ecology; exploration and mobility. 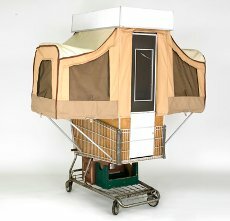 It is a pop-up camper constructed out of a shopping cart. If living in a camper on top of a kart isn't your thing maybe you can try out his Camper Bike instead. 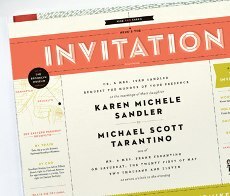 Kelly created this awesome wedding invitation for her friends Karen and Mike. It is a paper record player which houses and plays a flexi disc pressed with their original song, inviting guests to the wedding. Sweet! 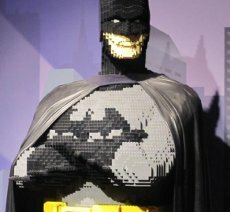 Someone spotted this life-size statue of Batman made of Lego in a Lego store in Tysons Corner Center in Virginia. The statue comes with a leather cape. I guess making a cape out of Lego is nearly impossible. Now all it needs a life-size statue of Robin the Boy Wonder in Lego. According to this awesome Flickr photoset, Old Anti Gravity Cruisers of New Zealand, New Zealand has been using anti gravity since the 19th century! 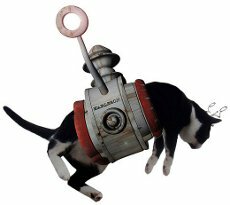 This is the Karlsson Cat Levitator invented by Swedish immigrant Per Karlsson in the early 50s for pet owners who love to see their cats hover in mid-air. Someone should go ahead and remake this! 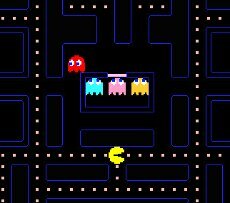 World's Biggest Pac-Man is a game collaboration between Microsoft and Pac-Man to show off the capabilities of the fast new Internet Explorer 9. Use exits to enter adjoining mazes at any time. When maze is complete, exit the maze to start a new one. Flash game doesn't work on Firefox but it works ok on Chrome and IE of course. 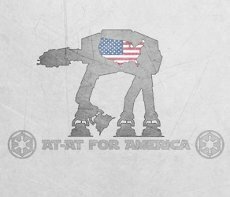 Mike wants to make America awesome again by building an AT-AT from Star Wars. He has received donations for this momentous task, 2000 fans on Facebook and hundreds of volunteers including mechanical engineers and builders. But all this is coming to an end because Lucasfilm doesn't think this is proper. Boo! Dan Wilbur on his blog Better Book Titles: "I will cut through all the cryptic crap, and give you the meat of the story in one condensed image. 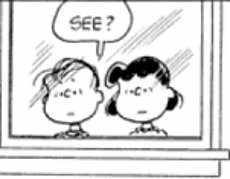 Now you can read the greatest literary works of all time in mere seconds!" 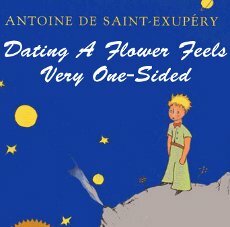 This is his title remake of one of my favourite books of all time, The Little Prince, "Dating A Flower Feels Very One-Sided". Brilliantly summarised Dan! 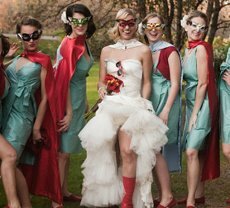 Megan loves Marvel comics so for her wedding, she decided it has to have a vintage superheroes theme: "I wore a custom designed dress by designer-turned-friend Eva Brzáková in Prague with a splash of red, cream and chocolate polka-dot detail, the bridesmaids wore vibrant aqua dresses with red hand-knit boleros and red canvas TOMS shoes." In Star Wars Episode V: The Empire Strikes Back, Han Solo was captured by Boba Fett and was frozen in carbonite for delivery to Jabba the Hutt. 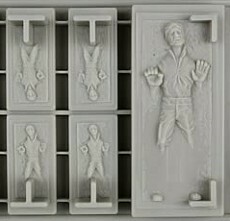 This Han Solo in Carbonite Silicon Tray lets you relive that moment in cinematic history by letting you make ice, chocolate or jelly in the familiar shape of Jabba's prized possession. GH Yeoh is the founder and creative director of Super Nature Design, a Shanghai based multi-discipline design company. It specialises in interactive design, visual communication and media technology. 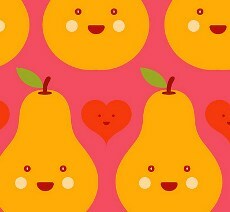 This is his Flickr photoset featuring characters he calls Mr Pear and Friends. Stop whatever you are doing tonight at 9pm and tune in to Vasantham to catch the Singapore TV premiere of Endhiran, a 2010 Tamil science fiction film which took nearly a decade of pre-production work and two years to shoot! Don't understand Tamil? It's ok! Just check out the clip above. My friends at Boing Boing calls it the most astonishingly violent and demented action-scene in cinematic history. You have to agree. It's badass! So super ridiculous that you have to watch it on Vasantham tonight. 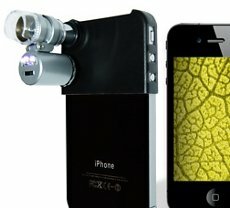 Mini Microscope for iPhone is a compact 60x microscope that is compatible with iPhone 4 only. It comes complete with three LEDs to illuminate your close-ups. The Mini Microscope for iPhone will not replace your real microscope but it sure is fun to have when you're outside and you need to get really close to a bug or a leaf. This ridiculous looking outfit is actually a flight attendant uniform created by Emilio Pucci in 1965. It is part of a collection of airline uniforms, matching shoes, handbags, luggage and other accessories amassed by a former Braniff flight attendant who flew with the airline for 20 years. Her collection is now available on eBay. 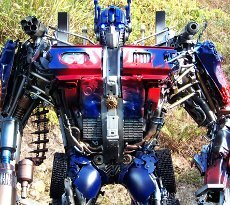 Some Chinese dudes have created sculptures of the robot characters from the Transformers movies using nothing but scrap metal! They have built Optimus Prime, Bumblebee, Megatron and even Starscream! The details on these sculptures are incredible and I think even Michael Bay would be highly impressed. The folks from ComicsAlliance have commissioned a massive mural to commemorate the upcoming 15th anniversary of the Marvel vs. DC crossover. 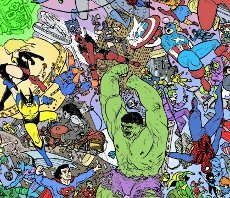 The mural features Marvel and DC characters in the midst of an epic battle packed with hidden characters and items for you to find. It's like Where's Waldo! How many can you find? 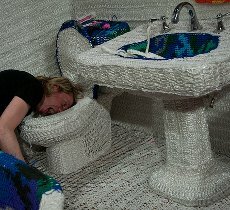 Knitting is for Pus**** is Polish-born, New York-based artist Olek's first solo show featuring an entire room completely covered in crochet! She says: "My use of crochet can be interpreted as a metaphor for the complexity and interconnectedness of the body, its systems and psychology, and, in a broader sense, it can represent humanity itself." Dave Mott made these delightful World War II inspired Star Wars insignia sketches: "Lately I’ve been inspired by the work Disney did during World War II. Disney designed/painted 1200 of these insignias. 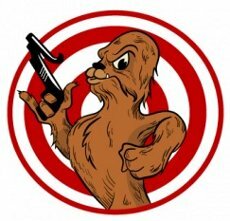 I thought about the Star Wars series and what if they painted insignias on their vehicles what would they look like? " Please do more, Dave! 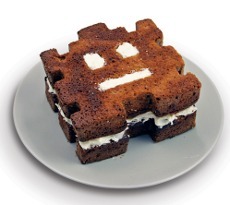 The microwave-safe Retro Arcade Cake Moulds are designed to hit the sweet tooth of all die-hard gamers of old, those of us who spent all our pocket money on Space Invaders, Asteroids, and Pac Man. 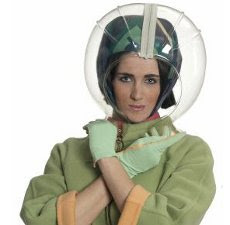 So put down your muffin trays and get down to making some space age sponge cake! 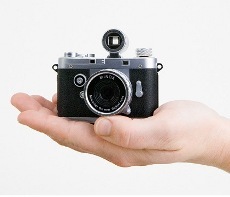 Minox has made a teeny replica of the Leica M3 with finely-detailed miniature moving parts, 5.1 megapixel resolution, one button function for photos or videos and a high-quality German-engineered glass lens with 4x digital zoom. The camera takes SHDC memory card slot and has 128MB internal memory. 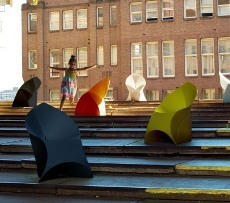 I love the Flux Chair! It transforms from a flat package with a handle into a designer chair and back again. A folding chair not only saves valuable floor space and makes moving a breeze, more importantly it allows you to sit down wherever you like - the beach, the park, you name it! 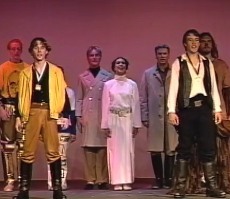 For the first time in 15 years, you can now watch Star Wars the Musical in its entirety. Recorded on May 25th, 1996 at Palos Verdes Peninsula High School, the musical was written, produced, and directed by students without any adult supervision. Kelly's 35mm Pinhole Hasselblad is a paper Hasselblad camera that you can download as an A4 sized, 8 page PDF. 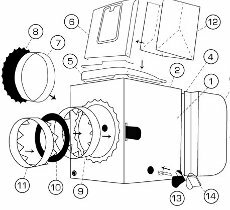 Print it out and follow her instructions and you'll have a functional camera that takes 35mm film and takes 12-14 images per roll. Kelly has made a screen-printed corrugated cardboard Hasselblad that accepts 120 film too! The Record Books is a playful collection of popular musical albums re-packaged as well-worn books. 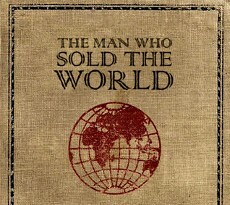 This is The Man Who Sold The World, the 3rd studio album by David Bowie and it is also the title of a song in that album. I prefer Nirvana's version of the song which they did for their MTV Unplugged album which is one favourite listens of all time! My favourite ice cream Ben & Jerry's is having its Free Cone Day from 12:00pm to 7:00pm today! Get a free cone with Vanilla, Strawberry Cheesecake, A Cookie Affair, Phish Food or Clusterfluff (new flavour!) at Ben & Jerry's Scoop Shops at VivoCity, United Square, Great World City, The Cathay, Heeren, Raffles City, Dempsey, Zoo, Bird Park & Sentosa. Also don't forget to donate generously to Dyslexia Association of Singapore when you are there. Dyslexia Association of Singapore is a non-profit organisation dedicated to helping dyslexic kids overcome their learning difficulty and achieve more in life. Update: Here are photos of people queuing at United Square, Heeren and VivoCity for the Free Cone Day. 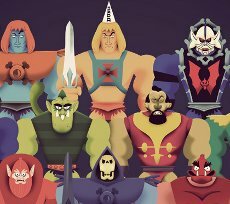 Christopher Lee created this wonderful art piece titled Mr Villains Class of 1993 for the "We'll Be Right Back...After These Messages", an art show that pays homage to the classic cartoons of the 80's and early 90's. He says, "I've been dying to do a fan piece for a while now so this was the perfect way to celebrate nostalgia." 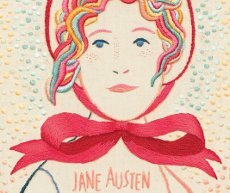 Jillian Tamaki got a gig to design covers of classic Penguin novels using embroidery! So far she has done 3: Emma, Black Beauty and The Secret Garden. The covers wraparound and include french flaps. The books will be widely available in most major and indie bookstores come this October. Here's a simple gummy trick for those of you planning your next dessert buffet party. 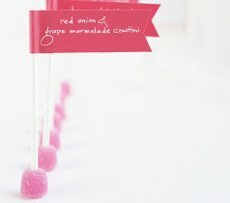 You can make labels for your guests using little paper flags and small straws and then stick them on gum drops so that they will stand upright. What a neat idea! John Karpinsky on his beautiful Star Wars prints that he is selling on Etsy: "Star Wars was a large part of my childhood, which sadly passed long ago. This is my tribute to characters of my youth, an invitation to the celebration of that cultural phenomenon that shaped my life so long ago." 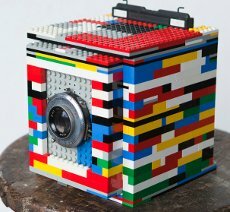 Why buy a 4×5 large format camera when you can make one using LEGO?! Cary did just that! He says about his Legotron: "The focus range is limited to roughly 3 feet to about 18 inches. It’s good for portrait, but certainly can’t focus to infinity." Dude has one of the most amazing cosplay costumes that I have ever seen! 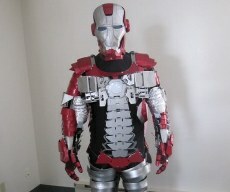 He has made an Iron Man Mark V Briefcase Armour inspired by the suit seen in Iron Man 2. It transforms from a briefcase into a fully-detailed, fully-functional suit of armour. Watch the transformation video here. For her son's 10th birthday, Victoria decided to throw a LEGO themed birthday party. She writes: "I bought a box of Lego at BigW and then bought some wheels, axles and steering wheels on eBay. Then divided them all up to make the kits. 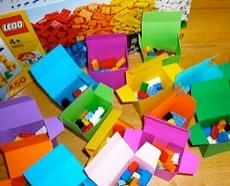 The Lego kits were used during the games and each child got to take home their kit." 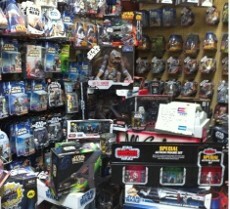 Dude is selling his entire Star Wars toy inventory plus other toys on eBay for US$35k. He writes: "The toys are from 1995 to present. I've been in business for about 12 years. It is a good business for those who love to do toy shows or start your own business or add to your own store inventory or collection."